JERUSALEM (CNN) -- Some Israeli archaeologists are having a particularly happy Hanukkah, thanks in part to a British volunteer who took time off from her job to work on a dig. 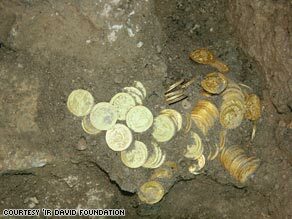 Archaeologists found a hoard of gold coins from the 7th century in Jerusalem on Sunday. Nadine Ross, a British archaeological volunteer, happened onto the coins during the dig just below the walls of the Old City of Jerusalem. "To be honest, I just thought, 'Thank God I didn't throw it in the rubbish bucket,' " said Ross, who had taken four weeks off from her engineering job in England to work at the site. "I was just glad I sort of spotted it before I disturbed it too much." The authority said that while different coins had been minted during this emperor's reign, the coins found at the site represent "one well-known type." In that style, the emperor is clad with military garb and is holding a cross in his right hand. On the other side is the sign of the cross. Authorities said the excavation of the building where the hoard was discovered is in its early stages. They are attempting to learn about the building and its owner and the circumstances of its destruction. "Since no pottery vessel was discovered adjacent to the hoard, we can assume that it was concealed inside a hidden niche in one of the walls of the building. It seems that with its collapse, the coins piled up there among the building debris," Ben-Ami and Tchekhanovets said. The find is a a golden moment for Ross, who said "it is a pity that I can't take it home with me. But there you go." CNN's Shira Medding and Ben Wedeman contributed to this report.